The tiny magnets (shown below) are 4.0mm in diameter and 1.5mm in height. 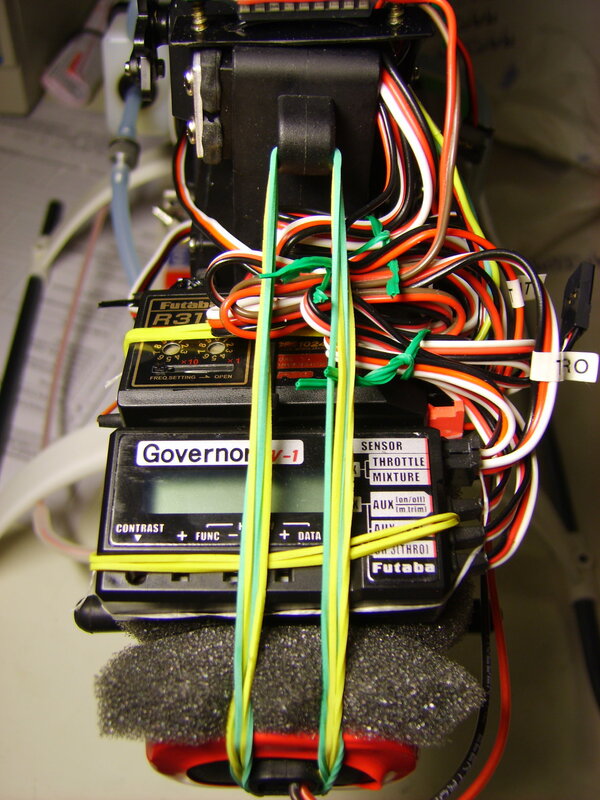 The sensor reacts only to one of their poles, which I marked with a red marker. 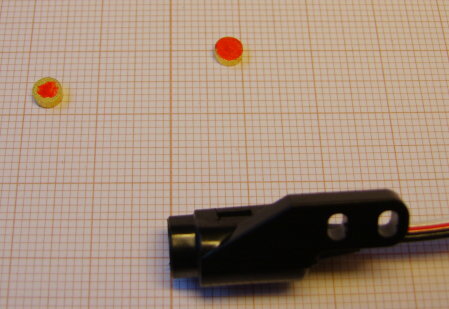 The magnets mass is around 157mg (the left one weighs 156.8mg, the right one 157.2mg). This is the equivalent of 0.91 kg in the earth’s gravitation. This unbalance will cause the fan to vibrate heavily. Therefor, the second magnet can be mounted on the opposite side of the fan, thereby rebalancing the fan. To keep the sensor happy, this second magnet should be mounted “upside-down” so it does not trigger the sensor. Mounting the sensor to the engine is done using one of the three stays (one for .30 size engines, one for .50 size engines and one for .60 size engises). The stay fits on the engine in both directions (jumping away or towards the engine), but the frame of the Raptor is just a little to small to use the “away” position. To get an optimal signal, I had to mount the sensor a bit rotated to the “outside”. 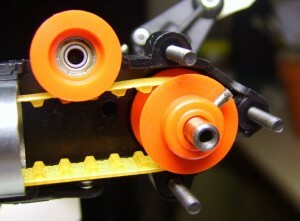 The GV-1 needs to be inserted BETWEEN the receiver and the throttle servo. 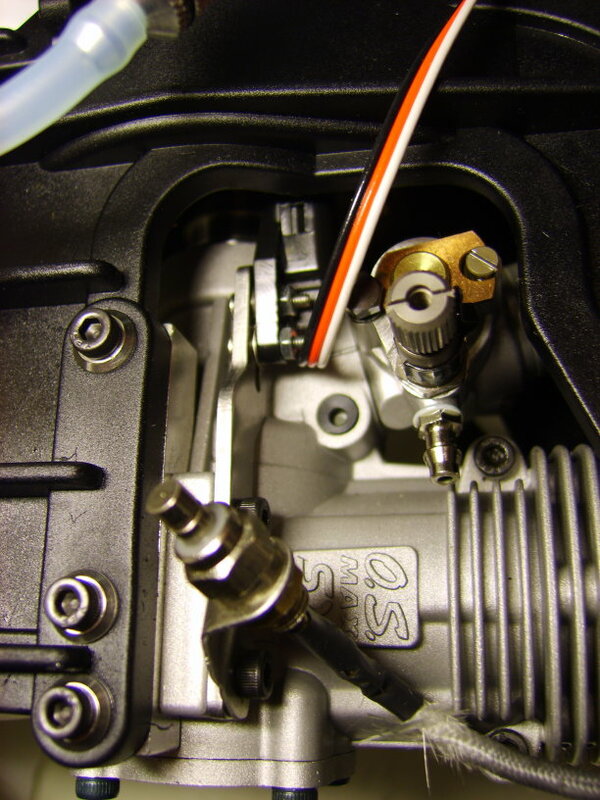 When it is inactive, the received throttle-commands are just passed on to the servo. 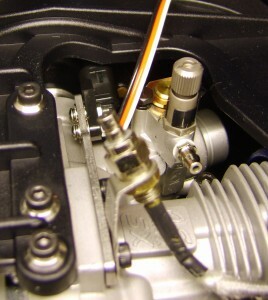 When engaged, the received throttle-command is mostly ignored and the feedback mechanism controls the throttle. The on/off/mixture channel can be used to turn on/off the governor. Switching the governor on/off can also be done using the rpm-selection channel (by setting 1 point to 990rpm which equals off) or the throttle-channel (throttle below 15% turns off the governor). 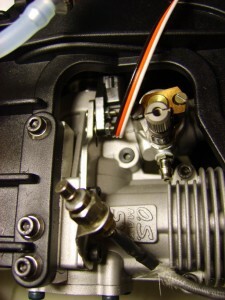 This third channel can also be used to control the mixture of the engine. Since the governor takes over the throttle-command, it needs to adjust the mixture as well. The outputs are obviously the (governed) throttle and mixture. 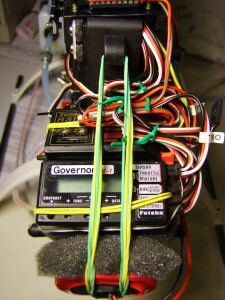 The top connection is for the sensor. The GV-1 has a list of settings you can adjust. Adjustments need to be done on the unit itself using very small buttons. I found it easiest to use the micro screwdriver that came with the unit to push the buttons. The transmitter needs to be adapted as well. I chose to use my Idle-Up modes to control my governor. All my Idle-Ups have the same -9°:+9° pitch range, so it made sense to use the different modes for different head-speeds. IdleUp3 is on a different switch and only used for testing; it just uses the governor settings from the Normal/IdleUp1/IdleUp2 switch. ThrottleHold knows how to override the governor to the off position. 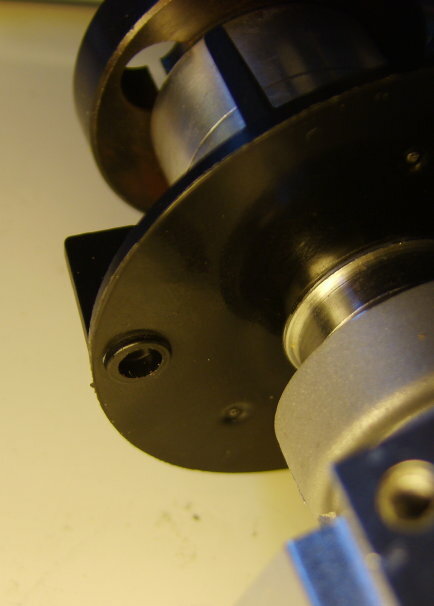 This entry was posted by Niobos on 2008-08-16 at 0:46 under RCheli. Tagged adjustment, logbook, maintenance, raptor. You can skip to the end and leave a response. Pinging is currently not allowed. Follow any responses to this entry through the RSS 2.0 feed.